> McAfee > Here's why Plug-and-Play is the only way to deploy your next firewall. 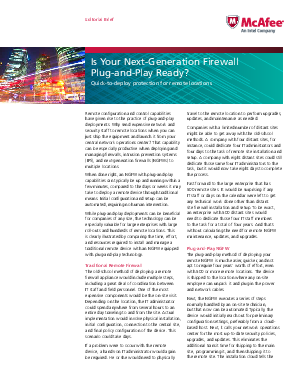 Companies of all sizes with multiple remote locations can benefit from plug-and-play next-generation firewalls. Traditional methods can take a long time to implement and can prove expensive. With plug-and-play deployments, on the other hand, you save money, conserve resources, reduce the likelihood of errors, and get single-pane-of-glass centralized management.